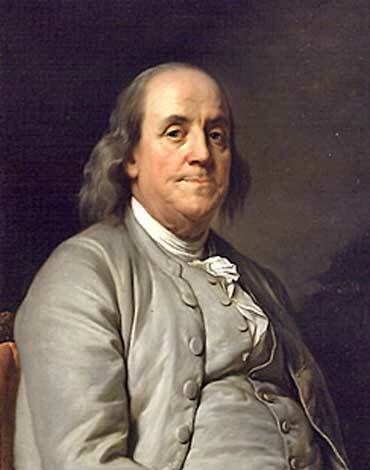 To me, no one signifies American patriotism, liberty, innovation and work ethic like Benjamin Franklin. His inventions, his public service, his wisdom, and his writings are all American treasures! So many years ago when my wife and I were told that our first child was expected to be a boy who was due to be born around the 4th of July, I got my wife to agree to name the child “Benjamin”. When we had a lovely daughter instead, we postponed the “Ben-naming” until the next child. Here they are, sort of a list of American proverbs based loosely on our Judeo-Christian heritage. 5. Frugality. Make no Expense but to do good to others or yourself: i.e. Waste nothing. 6. Industry. Lose no Time. Be always employ’d in something useful. Cut off all unnecessary Actions. 7. Sincerity. Use no hurtful Deceit. Think innocently and justly; and, if you speak, speak accordingly. 10. Cleanliness. Tolerate no Uncleanness in Body, Cloaths or Habitation. 11. Tranquillity. Be not disturbed at Trifles, or at Accidents common or unavoidable. 12. Chastity. Rarely use Venery but for Health or Offspring; Never to Dulness, Weakness, or the Injury of your own or another’s Peace or Reputation. In a visit to Ecuador last month as part of a mission team from Free Christian Church in Andover, MA, I was accompanied by Patrick, a civil engineering student, Myles, an engineer in the aerospace industry, David a well-traveled professional, and David’s two young adult children Marianna and John Henry. We were guests of Cheryl and Bruce Rydbeck of HCBJ Global, a Christian missionary group that now has a presence in 100 countries. Though our primary focus was working on a clean water project with an indigenous community in the Andes, we witnessed some other opportunities to minister to those in need abroad. 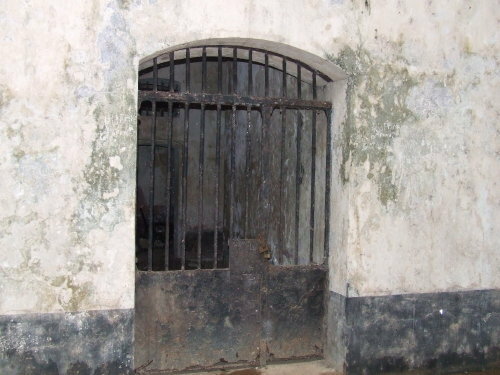 The first was Garcia Moreno Prison in Quito, a maximum security men’s prison. Seeing that this is the FIRST maximum-security prison that I have visited in a third world country, I obviously did not know what to expect! That being said, Bruce made sure we were fast learners by immersion. The prison is in the poor historic colonial part of the city, surrounded by food vendors selling to the many family members in line waiting to see their incarcerated father, brother or husband. 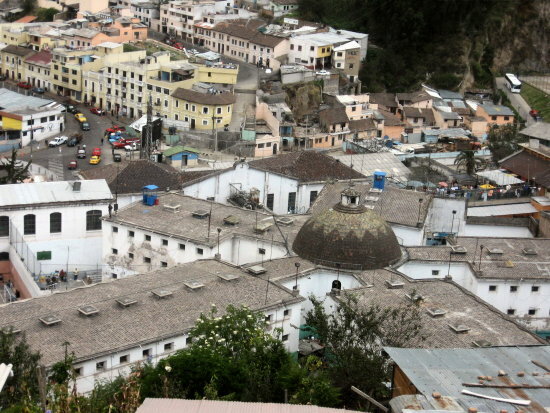 As one of the largest of Ecuador’s prisons, Garcia Moreno has been referred to as a “prison-city”. Designed to house 300 inmates in the 1870’s, it purportedly has housed as many as 1800. It has an economy of its own, where prison food vendors and “restaurants” are located throughout the prison. Everything from cigarettes, drugs, and prostitutes are sold, as are bars of soap, soda, and snacks. In South American prisons there are no visiting rooms with glass walls; you simply are let into the prison population. On the visitor days, children and wives mingle with the inmates while prostitutes wander the cells looking for customers. Murders are somewhat common, and there have been many riots. In 2004 inmates took over the prison for 10 days, demanding better living conditions. We were all a little concerned about bringing lovely young Marianna in there; everyone except her that is. It turned out fine and in the two visits we had into Garcia Moreno there were no physical altercations. Security was visibly high, with heavily armed men in flak jackets seemingly limiting what could be brought into the facility. There were several security checkpoints to go through. 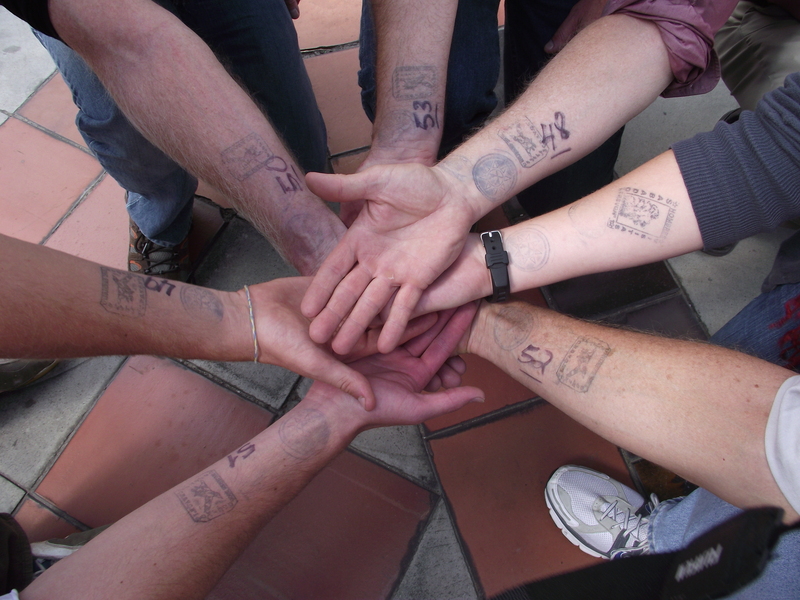 At the first one we had to turn over our passport; we were not really thrilled about that… At the second checkpoint, still outside, we were frisked (thoroughly) and given the first of several stamps on our arms. This is about all that would distinguish us from the population. At each point we would receive another mark. After being let into the general population, we were beckoned from all angles by men asking for “dollars” in a variety of languages and accents. Others were trying to sell us goods that were purportedly made by them. Everyone spoke at least some Spanish, only a few we met spoke reasonable English. Conditions ranged from modern to simply medieval, with the only difference being an inmate’s ability to pay for his own standard of living. Money means everything here and there is a daily struggle to get money to pay for basic services. With it, you can buy yourself a reduced sentence and even your freedom. You can live reasonably well and anything at all can be smuggled in for a price. Without money, prison life is sheer misery. Since prisoners have to pay rent for their cell and pay to maintain it, those without money just sleep on the floor in a communal area and eat sparse quantities of the barely edible food that is provided. Those that have family members who send them funds to bribe officials and guards might have a nicer cell with television and internet. Prisoners live with constant demands from other prisoners and guards for money. On occasions a prisoner’s family is contacted and told that he will be harmed if money is not forwarded. The typical prisoner is a petty criminal or a tourist who made the mistake of purchasing, sharing or selling drugs and was caught. Sometimes they are desperate for money to get back to their homeland and unwisely choose to work with a drug dealer. There are stories of the drug dealers themselves turning in the future prisoner to curry some favor with police. We were told that very often men that were caught with only small amounts were given the same sentence as a significant dealer in drugs. The dealer then can buy his way out, while the petty criminal without money just rots here. There were no Americans in this prison so we got to know a few of the prisoners from around the world that spoke reasonable English. We brought them magazines and newspapers to pass the time. There are a lot of sad stories here; some have learned their lesson and are spending their time praising God and preparing for the time when they get out. Others are just filled with hate and despair, having given up and still using drugs in prison. Again, those with money can get by, those without money suffer continuously. Consider “Leonard” from Canada who we met during a Saturday worship service. His family sends him money so he has been able to afford a lawyer and lives reasonably well in the prison. He looks fit and confident as he knows he will eventually get out and his time here is long but bearable. He could apply to his country to fill out the remainder of his term at home, but he would then be a felon in Canada and would never be allowed into the United States again. He says he owns property in the US. Leonard’s lawyer recently told him that he got his sentence reduced from six years to three years. The cost for this legal work was: $1500, plus another $5000 for bribes and fees to government officials and judges! Leonard met a woman while in prison, perhaps a prostitute or a friend of another prisoner. They developed a physical relationship and now have a child together. Though I doubt that the woman or the child figures in his plans when he is released, he proudly told me that he intends to make sure his new son will be able to get Canadian citizenship some day if he wants it. Sadly he did not mention the woman at all. Marius is from Lithuania and is close to fulfilling the first three years of his six year sentence. He is one of those who has little money and is having a terrible time behind bars. Once his term is half-filled, he will be eligible for a work release as long as he can find a job and a place to live. Unfortunately for him, there are few jobs and he has no money for a place to live so he is stuck for now. Marius’ close friend Daniel is in a similar state, and they have the marks of helpless despair. Nether of their countries are doing anything to help them. Consider Yanko from Russia who is hoping to get his country to transfer him home and let him finish his sentence there. He believes it will happen but has no idea exactly when so he just waits. If he is able to get a transfer, the Russian government will simply let him go free. During a Saturday worship service held in a small packed room, we shared our own testimonies and encouraged the prisoners with the fact that God has a plan for them, even now. We told them that they eventually should be released and may still live a fine life once they get out. Even though most of the service was in Spanish and few spoke English, we knew that we are bonded together in our love for Christ and a desire to serve Him. We could see in their faces evidence of the hard life that they have led and the pain they have in knowing that they have made a mess of their life. But in faces of the more mature Christians among them, we also the joy and relief that they have knowing that God loves them and has not forgotten them. Raw TV has a show called Locked Up Abroad where they have prepared a true-life dramatization of people who have been imprisoned in third world countries. If you want to get an idea of what the actual experience is like, check out http://www.dailymotion.com/video/xj4qs2_locked-up-abroad-ecuador_travel . Much of the video was filmed in Garcia Moreno. Haiti has been a wasteland for as long as anyone can remember. It may seem like picking on them when they are down, but it is obvious when you go there that Haiti cannot continue to operate in the dysfunctional manner they have for the last 100 years. If they do so, it is likely that they will continue to suffer even greater tragedies. Haiti is operating in survival mode with each citizen just doing what they can to survive. There is very little concept of savings, planning, investment, workmanship, beautification, etc., since each day is a battle to simply live. They have had their share of corrupt leaders and natural disasters, but at its core, they do not have a culture that promotes a strong work ethic, good workmanship, planning, and personal responsibility. While our unique American culture is far from perfect (and perhaps getting less so by the day) it is obviously one of the more desirable nations on earth, and has been for at least 100 years. Perhaps unwittingly, we have historically employed a “melting pot” strategy: we invited immigrants to become part of a great experiment in a new world, and bring their best with them! Generations of various peoples have come here and thrived when they learned English, adjusted to our culture and became an asset to the community. By welcoming immigrants at all income levels, we provided a stable culture base where those from around the world could have a chance to prosper. This quote is especially surprising coming from Teddy since he is also known as one of the first progressives even though he was a Republican. This Roosevelt is often vilified by conservatives due to some of his beliefs that the average person needed to be managed by the government rather than generally left alone to their own devices. In recent decades, we have encouraged immigrants with no skills and no ability to support themselves to come here. We have told immigrants to put a wall around their ways of living that have been transmitted from one generation to another and re-establish them here, even if they have failed to bring them sustainability. This can bring some of the best, but also the worst of their culture to a society that is not designed to deal with completely different culture standards. Without embracing the freedoms and systems that our country has successfully developed over the years, many of these people have become liabilities, not assets. They have not prospered, and have become a drain on our financial stability, not to mention their own. The Great Society programs developed out of the European ideal of “equality”, over our traditional American ideal of “liberty”. Instead of a monoculture that is constantly improving with new immigrants desiring to become part of this great American experiment, we are told that entire societies can locate here, and does not have to make changes to prosper. As the United States under President Obama has taken dramatic steps in an effort to move us more towards a multi-cultural society, Europe is seen moving the other way. At the same time that we have witnessed violent riots in France, Greece and great cultural dissension in the United Kingdom, liberal Germany is declaring the experiment a failure. As Chancellor Angela Merkel stated late last year; “This multicultural approach, saying that we simply live side by side and live happily with each other has failed. Utterly failed,” Merkel said. While President Obama seems to be unfazed, the rest of the nation seems to be listening and are demanding that we not be so quick to abandon a culture that has been the most prosperous in history. We still have something of a core culture, a shared sense of moral beliefs and ideals, a desire to prosper and succeed to some extent our own merit. But encouraged by a call for diversity, many cultures create outposts of their own monoculture in America. They have not benefited from Judeo-Christian teachings that are at the root of our society. If a culture has led generations of its citizens to poverty in their own land, why do we think that they will thrive when bringing that exact culture here? It is antithetical to our unique society that we can be pulled in multiple directions, with different sets of eyes. Even without Germany’s assessment, it should be clear that if we end up with many different cultures trying to live the same as they did in their homeland instead of blending into our culture, we will all have completely different sets of ideals, beliefs and mores. This causes friction between the cultures and keeps us from being a cohesive society. Multi-culturists cringe at the thought that one culture is more “successful” than another, and would counter that success is in the eyes of the beholder. But the world is filled with cultures that do not embrace those tenets, and few would refer to them as successful by any measure. Poverty has gripped many nations for hundreds of years, and it can’t be all blamed on bad luck or imperialist nations. Whether the reader is religious or not, it is hard to argue that the common sense and discipline that the Bible delivers, provides the basis of most of our broader beliefs and practices. Would anyone here want to move to a nation anywhere on earth of any significance that does not have Judeo-Christian teachings at its core? Would we embrace a life that did not give people individual freedoms and equal rights, promote a strong work ethic, give them the opportunity to thrive, or allow for freedom of thought and expression? I am not sure that the American Federal Government can straighten out Haiti at any price. But I do believe that if Haiti embraced the common sense and work practices employed in the last century in the United States, they would be well on their way to prosperity for the next generation.